So it's finally here. After a 12 day lay-off since the George Mason last played in the CAA tournament we get to see them today in white jerseys for the first time in the NCAA tournament. We already talked in-depth about how the two teams match-up in this one but I just wanted to share some final thoughts before this afternoon. Here is a preview of the game CBSSports.com. 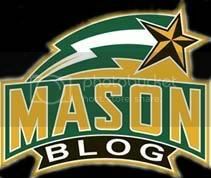 I like this preview because Jon Rothstein has been following Mason all season, even before their national leading winning streak. He gives praise to the Patriots' depth at guard and the play of Cam Long and Vertrail Vaughns off the bench. Create favorable matchups. Last year they did a good job of this and is the big reason why they were leading most of the game in Puerto Rico. Mason does this the best on the perimeter and if they can force the Wildcats into some bad mismatches there you will see some open looks from behind the arc. Three-point shooting could be the biggest factor today as Villanova's last couple of opponents have had a lot of success from there. Keep Villanova off the offensive boards. You saw how this doomed ODU yesterday and they were a team that made a living off the glass this season. Even weaker rebounding teams step it up in the tournament and the Patriots have to win this battle today. Start strong. I don't think I can stress this last key enough. Recently they have had some trouble defending in the beginning of their last couple of games. Their poor efforts on defense dug them into a 14 point deficit at the half of their last game against VCU and it turned out to be too big to overcome. Mason doesn't need to have a big lead at the half, as they have done their best work in the 2nd half this season, but they need to keep the momentum in their favor and not give up a lot of open looks.